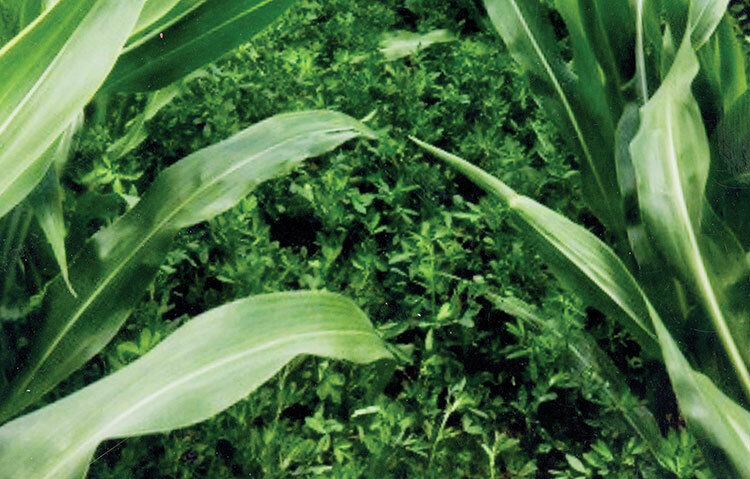 Evers Dairy has had good success establishing alfalfa under corn on a limited number of acres. The author was the 2018 Hay and Forage Grower summer editorial intern. She is currently working toward a master’s degree in ruminant nutrition at the University of Nebraska-Lincoln. If the early morning drive to my next farm visit was any indication of how the day would go, it looked bright. Once I crossed the Mississippi River, the clouds told a different story. The closer I came to my destination, the more menacing those clouds looked. 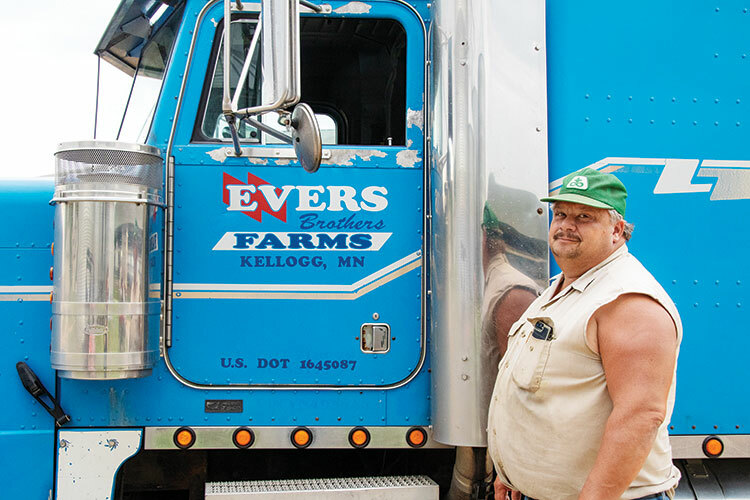 I had yet to see rain by the time I pulled into the driveway of Evers Dairy and was greeted by Wayne Evers. Wayne, whose role is general manager of the farm, owns and operates Evers Dairy along with his brothers Phil, Jerry, and Mark near Kellogg, Minn. They are located northeast of Rochester and not far from the Mississippi River. It’s pretty obvious that family is an emphasis on this farm with about 20 family members involved in the day-to-day operation. What’s also obvious is that this group isn’t afraid to break some norms — especially when it comes to alfalfa and corn silage production. Wayne Evers said that establishing alfalfa with corn really hasn’t posed any challenges yet, but he added that adequate soil moisture is needed. “Ever since I was born, we’ve been milking cows,” Evers reminisced as we mocked the ominous clouds by sitting out on his patio. He explained that from his grandparents on, the family has been in the dairy industry. They also haven’t wandered too far from their family roots. “We’ve moved within a half mile of each other for the last four generations, and milked cows every day since,” he added. Starting out, the four brothers milked cows in stanchion barns, each on their own separate farms. In 2001, the brothers consolidated their four herds into one and began milking in a double-4 parlor. The current farm operation was built in 2005 and features a double-24 parallel parlor. Just like what had been done over the past 50 years, the operation continued to grow and expand. “Pretty much every year, little by little, we’ve grown,” Evers commented. Today, the brothers have grown the Holstein herd to 2,000. This three-milkings-per-day herd has an average production of 80 pounds and an average fat and protein of 3.1 and 3.7, respectively. Aside from milking cows, the brothers also farm 3,500 acres of cropland. Of those acres, 2,500 are corn. There are 1,500 acres harvested as silage, 600 acres are shelled for high-moisture corn, and 400 acres are harvested as a cash grain crop. Eight hundred of the remaining acres are alfalfa, which is harvested for haylage four to five times per year. The remaining 200 acres are designated to whatever method is being used to establish alfalfa. That usually means seeding in late summer after peas, which are sold to a local canning factory. This year, only 150 acres were assigned to that practice. The other 50 acres are being used to try out a bit of a bolder approach . . . utilizing corn as the companion crop. The spring of 2016 was the first attempt at this uncommon establishment method. “I wasn’t real happy with the peas for establishing alfalfa,” Evers explained as to why they decided to give corn a try. “You have to work the ground again before establishing alfalfa, so erosion was a factor,” he added. Direct seeding alfalfa was also a challenge due to using their large equipment on rather soft ground. The economics with corn was also an incentive that Evers couldn’t ignore. “With alfalfa varieties having the HarvXtra trait, we can use Roundup to spray both the alfalfa and corn without having to buy any extra chemicals,” he commented. Small grains never appealed to Evers with the challenge of needing a dry period to harvest them and the dislike of oatlage as a feedstuff. “I just can’t come up with a system that works better,” he chuckled. At this point, Evers feels that both the corn and the alfalfa aren’t getting held back. “We get 95 to 99 percent of our corn crop, and we’ll come into alfalfa next year and get almost 100 percent right off the bat,” he explained. The best part of this establishment method, according to Evers, is the erosion control. “In 2016, we seeded down alfalfa following a crop of forage peas and got 7 inches of rain. There’s no residue on the field after peas, so we had erosion and definitely lost some alfalfa stand, too,” he explained. “Our ground really rolls with plenty of hills, so erosion is a big challenge,” Evers said as he motioned to the rolling field across the road from the farm. The corn hybrid that is used is the same 109-day silage hybrid that is planted on all 2,500 acres of corn. The spacing between the rows was left at their normal 20 inches. The only adjustment made was to the planting rate, reducing it to 32,000 seeds per acre from the typical 35,000. “I don’t know if that’s necessary or not,” explained Evers. “It really doesn’t affect when the corn canopies over the middle of the row.” According to Evers, the canopy closes at least by July, which doesn’t matter since the alfalfa is well established by that time. Evers continued to explain that they had previously used a 95-day corn to try and get the corn off the field sooner but felt that it didn’t make a difference. “The alfalfa didn’t green up anyway, so I don’t think it really mattered,” Evers elaborated. He also noted that any crown damage from field traffic was not noticeable in the following spring. Speaking of green, according to Evers, the alfalfa looks great until around mid-August when it wants to go dormant. “Just let it go dormant; you’re not going to harvest it anyway,” Evers advised. “It seems like the root mass is growing at the same time, and in the spring, it comes out growing with a vengeance,” he added. Planting is done within the first week of May to avoid some of the early-spring rains, which helps with erosion. Both the corn and alfalfa are planted on the same day with the corn going in first. The brothers then follow up with a Brillion seeder to pack the soil and seed the alfalfa. “You would maybe want to go out there with something else, but that’s what we have. It works for us,” Evers stated. The Evers’ chemical program saw little change with this new practice. In fact, it actually simplified their program. SureStart, a residual herbicide, is typically used on cornfields, but now only glyphosate is used when alfalfa is being established. Evers noted that the alfalfa seems to take care of the weeds, so they are able to get by with just one herbicide application. No chemical fertilizer is applied to any of the cornfields, and it’s been that way for the past eight years. Instead, manure out of the farm’s slurry store is injected in the fall. When asked what the biggest challenge with this practice was, Evers took a moment to ponder before responding, “At this point for us, really nothing.” The Evers haven’t seen any stand loss from having corn in the field, and the corn residue just “disappears” and never gives them any trouble. They also haven’t seen any compromise in relative forage quality (RFQ). A key player in Evers’ success is their heavy soil, which does an excellent job holding moisture. “I feel you have to have heavy ground to keep your water potential up. It could be the detriment to it all,” Evers stated matter-of-factly. To date, they haven’t been able to see how bad it can be in a dry year. The Evers’ 2,000-cow Holstein herd is oblivious as to how their alfalfa was established. All of the corn that is chopped for silage for Evers Dairy is high chopped. The chopper heads are set so that about 30 inches of stubble is left. “The main reason we do that is for erosion purposes on our hills,” explained Evers. 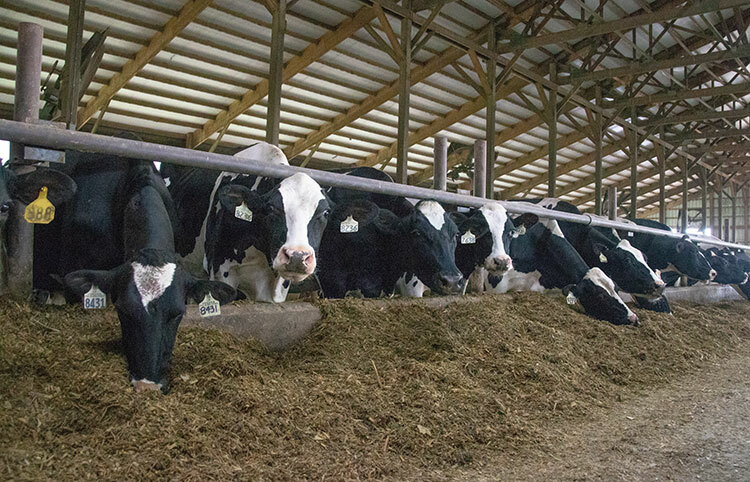 Getting high-quality corn silage with high-starch levels is another reason. This allows for less high-moisture corn to be included in their rations. Getting the longer stalk residue through the tillage equipment has been the biggest challenge of high-chop silage. The solution for Evers was switching from a field cultivator to a soil finisher with a row of discs in the front. “Once we did that, there was no problem,” Evers assessed. As we made our way across the farm to the freestall barn on Evers’ all-terrain vehicle, he pointed out the taskforce needed to harvest all of their forages. Four Claas choppers equipped with shredlage processors, 10 trucks, and one pack tractor comprise their forage fleet. “I know we have a lot of machinery,” Evers explained, as we now waited out the rain in one of the freestall barns surrounded by an audience of curious Holsteins. “When part-time labor is available, I want machines ready for them to use,” he added. Evers explained that a typical day of chopping started with one chopper and a couple of trucks in the morning. By noon, there would be two choppers, and at three in the afternoon, because help keeps showing up, three choppers and six to eight trucks would be in the field. Both silage and haylage are stored in 30-foot tall drive-over piles on 5 acres of concrete. Evers chose drive-over piles rather than bunkers because of the restriction on the amount of silage that can be packed with bunkers and the safety hazard of packing tractors next to bunker walls. All of the runoff water from the silage pads is collected, which is required by the Minnesota Pollution Control Agency (MNPCA). About 5 million gallons of runoff is collected each year at Evers Dairy. Since they reclaim all of their sand bedding, the collected water is used to wash the sand. By the time I left, the clouds had decided they weren’t quite ready to call it quits. As my windshield wipers did the best they could to clear the impeding rain from my line of vision, I passed by the alfalfa-corn field that had been the topic of our earlier conversation. An awfully big gamble had been taken on that field. Luckily, the current rain was bettering the odds. This article appeared in the February 2019 issue of Grower on pages 26 to 28.